Ceja Vineyards is an ultra premium Latino family owned winery founded by Amelia, Pedro, Armando and Martha Ceja – first generation Mexican-American winegrowers in the Napa and Sonoma Valleys. The next generation represents the future of the wine industry and together they are focused on continuing the legacy of crafting beautifully balanced wines to enjoy with family, friends and your favorite dishes! Ceja Vineyards produces a diverse range of award-winning varietal and blended wines – all from our Napa and Sonoma estate grown grapes. We love the characteristics and age-worthiness of Old World wines and are proud to incorporate elements of this with our New World heritage. Making wines that are fruit forward while maintaining beautiful mineral structure and acidity reflects the classic hallmarks of a Ceja Vineyards bottle of wine: richness with elegance, concentration with approachability, and complexity with balance. Our dedication to sustainable agriculture and the gentle handling of the grapes in the cellar can be tasted in every sip of our estate Pinot Noir, Chardonnay, Cabernet Sauvignon, Merlot, Sauvignon Blanc, Syrah, blends and Dulce Beso late harvest white wine. 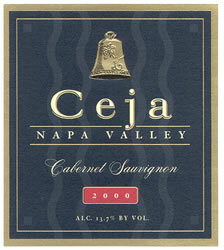 Ceja wines can be purchased over the Internet at www.cejavineyards.com, or, by phone at 707-255-3954. Enjoy with family and friends. ¡Salud! ¡Bienvenidos! We invite you to visit our beautiful wine tasting room and grounds. Please contact Ceja Vineyards at wine@cejavineyards.com or call 707-255-3954 to schedule an appointment. Music in Tasting Room: World beat with a Latin flair. View from Tasting Room: Wine tasting salon is artfully decorated and inviting. Patrons may also taste wine on our patio (weather permitting). Wine Education: Our knowledgeable and friendly wine educators are on-hand to explain and educate you on the beauty of wine! To join the wine club, visit www.cejavineyards.com or call 707-255-3954. We invite you to join our Casa Ceja Wine Club. We are delighted to offer you three options at great savings four times per year. For your continuous enjoyment of Ceja wines, you may choose 3, 6 or 12 bottles to be shipped or picked up in March, June, September and December. Ceja Vineyards Winemaker, Armando Ceja, carefully selects the newest releases to be included in each shipment (Sorry, no substitutions). Enjoy exceptional wines delivered conveniently and automatically to your doorstep from our Napa and Sonoma vineyards! Shipments may include a selection of our award-winning Sauvignon Blanc, Chardonnay, Pinot Noir, Merlot, Cabernet Sauvignon and Vino de Casa Red Blend.